Nintendo just dropped a surprise announcement today, out of the blue. First, the Wii U Deluxe set will drop in price by $50, bringing the price down to $299. This move is not unexpected, given the Wii U's poor sales numbers as of late. The price cut will take effect on September 20th. The second announcement introduces a Zelda Wind Waker HD Wii U bundle, which will also release on September 20th. 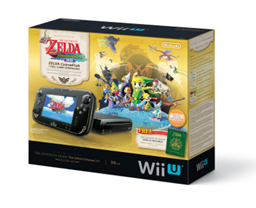 It includes the Deluxe Wii U, plus a download code for the game, and a special Gamepad emblazoned with Zelda designs. This means the digital version of the game will be appearing on the eShop on September 20th for everyone, several weeks before the physical verison. If you want a disc version of the game, you'll have to wait until October 4th. This special bundle will sell at the same reduced $299 price, making it the de facto bundle for most consumers come September 20th. Finally, Nintendo announced a lower cost DS, the 2DS. Featuring a non- foldable slate design, the 2DS will play 3DS games but without the 3D. It is also compatible with the entire DS library of games. Screen sizes are identical to the current 3DS model. It will launch on October 12th for $129, alongside Pokemon X and Y. Posted on August 28, 2013 by Eugene Huo and filed under News and tagged 2DS WiiU Zelda deluxe set nintendo pricing. Is it possible that eShop games for the Wii U will cost less than physical discs? Evidence points to yes, at least in Japan. Namco Bandai has confirmed that in Japan, the physical media version of the upcoming title Tekken Tag Tournament 2 Wii U Edition will cost 6,980 yen, while the download will be priced at 6,280 yen, according to Siliconera. That savings will come at a cost in storage though, as the download file is reportedly 16.7 GB in size. Better get that external hard drive ready! No word on North American pricing yet. Posted on October 26, 2012 by Eugene Huo and filed under News and tagged cheaper eshop namco bandai pricing tekken tag tournament 2.